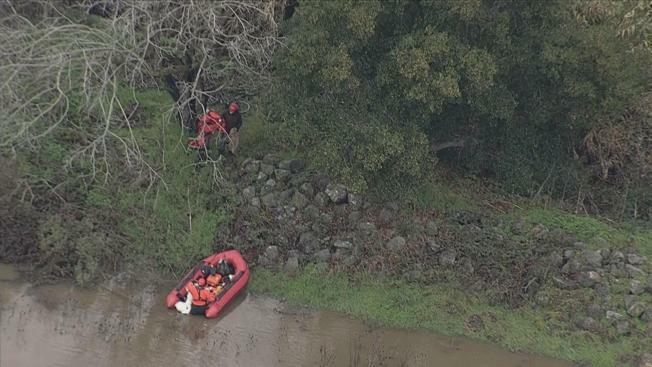 A 56-year-old man became trapped on an island near Milpitas on Thursday morning, after the swollen, swift-moving Coyote Creek surrounded him. Because of the rapid rise of the creek from recent downpours, he was unable to walk to shore and had to be rescued. Crews from the San Jose Fire Department Swift Water Rescue Team responded to North McCarthy Boulevard, near Highway 237, at about 12:15 p.m. They were able to cross the river with a boat and bring the man safely ashore. He had been on the other side of the bank, where there is a large homeless encampment. NBC Bay Area flew a chopper over the scene, which showed a calm effort to walk a red inflatable raft over to the man and ask him to get inside, and he did. A team of Milpitas firefighters waited back on the main shore to help him get out. The man was taken away in an ambulance, but his condition was unknown. No other injuries were reported. There were reports that the man had been out on the island for two days and had been yelling for help before someone finally called 911, fire officials said.